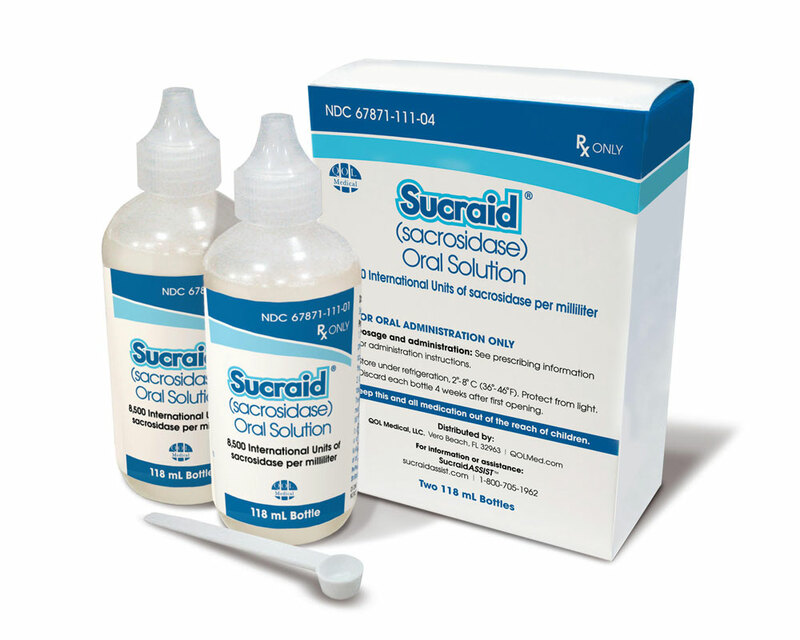 Sucraid is the only FDA-approved enzyme replacement therapy indicated for the treatment of genetically determined sucrase deficiency, which is a part of Congenital Sucrase-Isomaltase Deficiency (CSID). 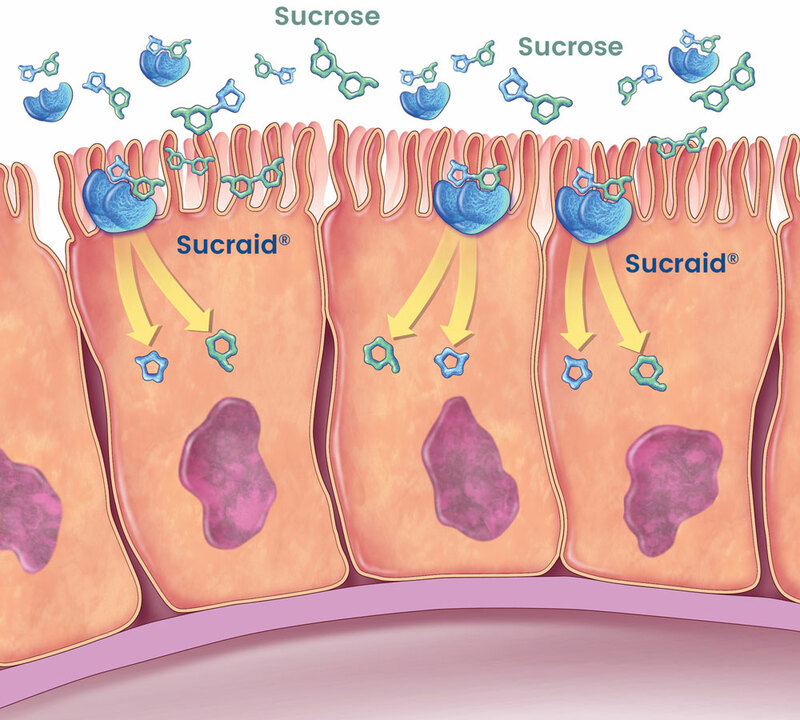 Sucraid is an enzyme replacement therapy that facilitates the breakdown of sucrose (sugar) into monosaccharides for absorption by the small intestine. It has been shown to help alleviate the gastrointestinal (GI) symptoms associated with CSID, and, as a result, patients can maintain a more normal diet that includes sucrose-containing foods. Although Sucraid provides replacement therapy for deficient sucrase, it does not provide specific replacement therapy for deficient isomaltase.4 Therefore, Sucraid does not metabolize dietary starches (for example, potato, bread, or pasta) and restricting starch in the diet may still be necessary to minimize symptoms in patients with CSID who are starch intolerant. When starting therapy with Sucraid, patients who still have symptoms are advised to restrict dietary starch for two weeks and then gradually reintroduce starch while monitoring for gastrointestinal symptoms. Keeping a dietary diary for the first few weeks of therapy is also recommended. Weijers HA, van de Kamer JH, Mossel DA, Dicke WK. Diarrhoea caused by deficiency of sugar-splitting enzymes. Lancet. 1960;2(7145):296-7. Treem WR, McAdams L, Stanford L, Kastoff G, Justinich C, Hyams J. Sacrosidase therapy for Congenital Sucrase-Isomaltase Deficiency. J Pediatr Gatroenterol Nutr. 1999;28(2):137-142. Treem WR, Ahsan N, Sullivan B, et al. Evaluation of liquid yeast-derived sucrase enzyme replacement in patients with sucrase-isomaltase deficiency. Gatroenterology. 1993;105(4):1061-1068.